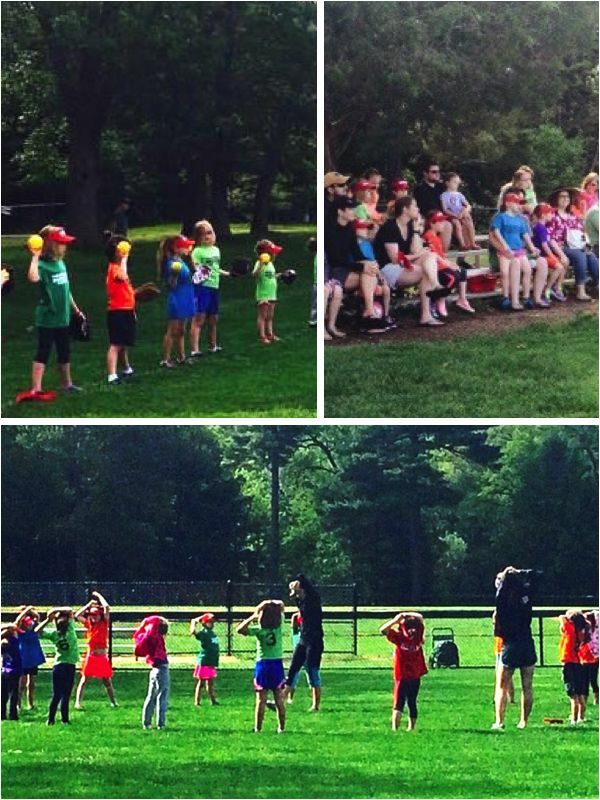 Milton Girls Softball is pleased to offer professionally run Pitching Clinics for girls in Grades 2 through Grade 8. These clinics are designed for girls who are interested in becoming better pitchers or would like to learn how to pitch. The Pitching Clinic consists of (4) 50-minute sessions over 4 weeks. This session is optimized for Beginners and Intermediates. Instructions include the basics of proper mechanics, correct footwork, arm circle, posture, grips for pitching. Age specific skills are taught, along with drills for accuracy, movement and power. Kaitlyn Sherman (view bio) will be running the clinics at Cunningham Park. Ashley Beese (view bio) will be running the clinics at Kelly Field. 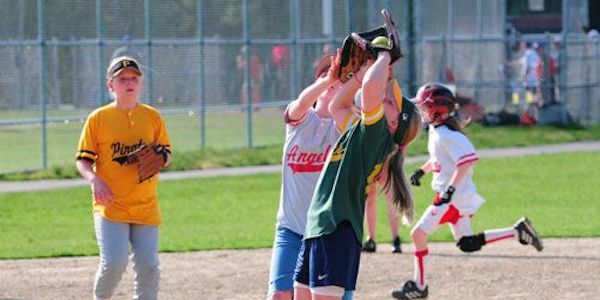 * Girls need to bring their own catcher – an adult or player. Catcher should bring bucket to sit on (if you have one), 1-2 softballs, and a small white towel to simulate home plate. Register for the time slot and location that works for you. Note: we will also be offering clinics in June (6/3, 6/10, 6/17 and 6/24) with these great instructors. More to come. 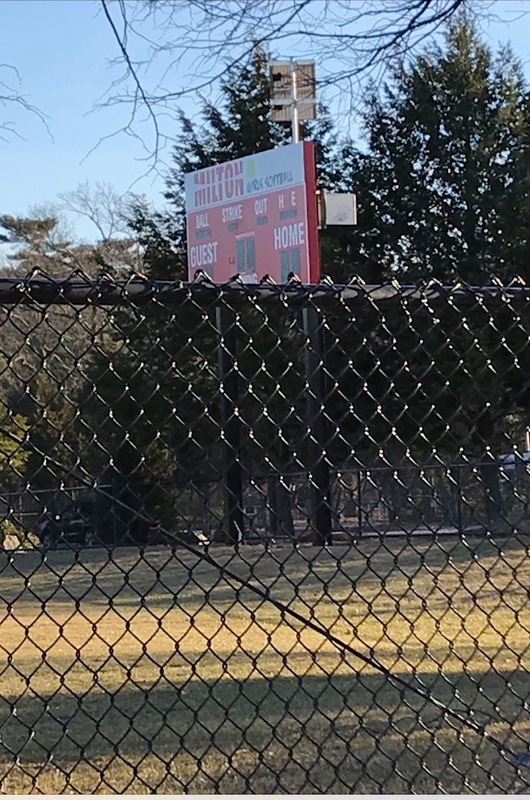 Milton Girls Softball is excited to share that we have a new scoreboard at Cunningham Park. Due in large part to the donation of the Friends of Donny Higgins, we have installed a new scoreboard at Cunningham Park. The scoreboard will be ready for opening day and will be dedicated during our Opening Day festivities. 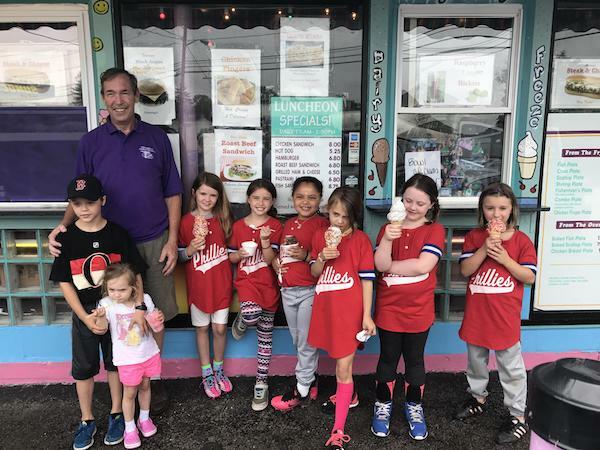 The Friends of Donny Higgins is a special charity that promotes local youth sports program and we are grateful for the contribution the organization has made to our program. Donny Higgins was a very special young man whose life was too short. He was a loving husband and father as well as a great son and friend to many. His wife and four children presently live in Milton. 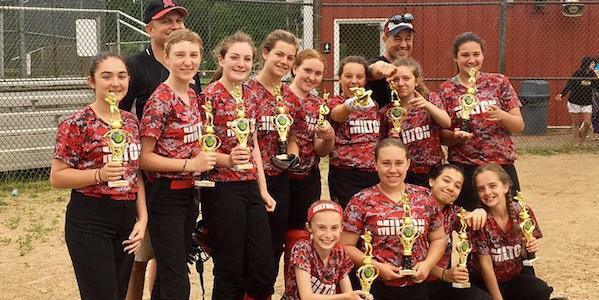 If you would like to show your appreciation for the donation Milton Girls Softball received from the Friends of Donny Higgins, please think about attending the Friends of Donny Higgins Winter Gala on Saturday Feb. 23rd, 7PM at the Westin Boston Waterfront. This is a wonderful event filled with food, drinks, laughs and conversation. Many of us on the board will be attending and we ask that you help support a great cause. The tickets include a buffet dinner and open bar. 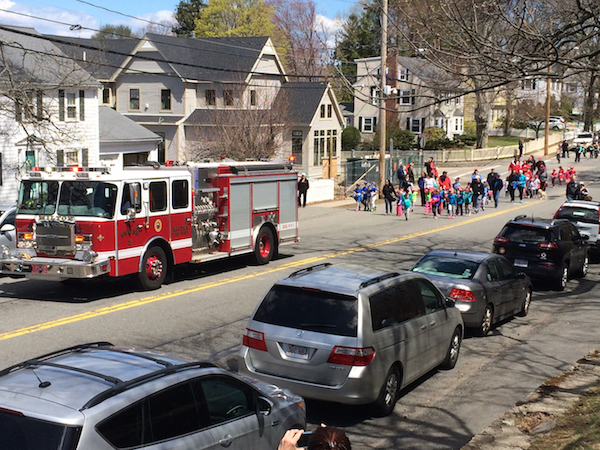 Many Milton residents attend to support this organization. Even if you cannot attend, please consider purchasing a ticket. Thanks for your continued support. 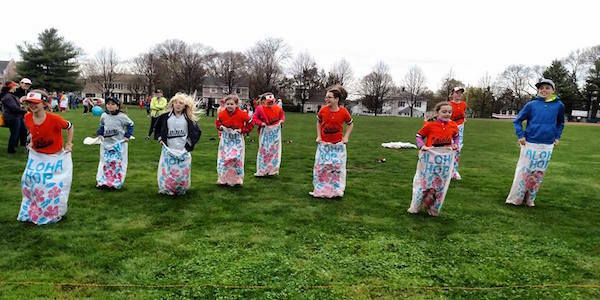 Milton Girls Softball encourages you to register for the 2019 Spring Season. For girls in Grade 1 through Grade 8 we are offering FREE Pre-Season clinics starting in late January and running until late March ($100 value). 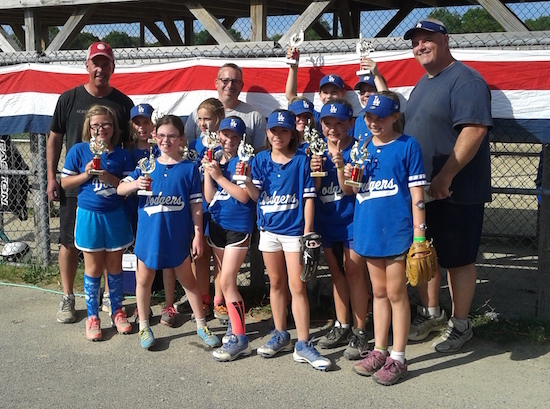 The clinics are held at Dirt Dawgs in Canton. View the complete Winter Clinics Schedule. Space is limited so sign up now to reserve your spot. 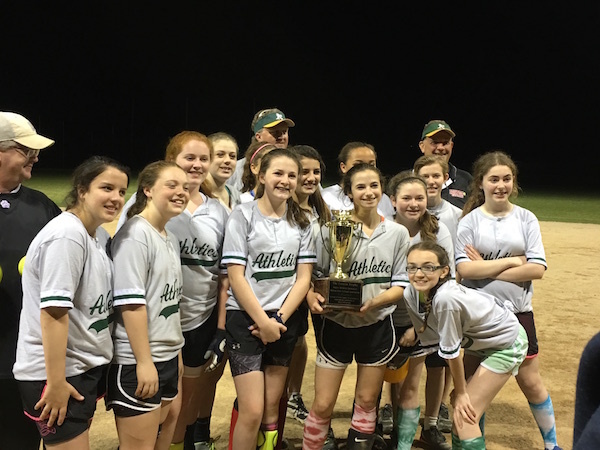 Register for the Spring Softball Season by clicking on appropriate link above or on the REGISTRATION LINK at the top of the page. 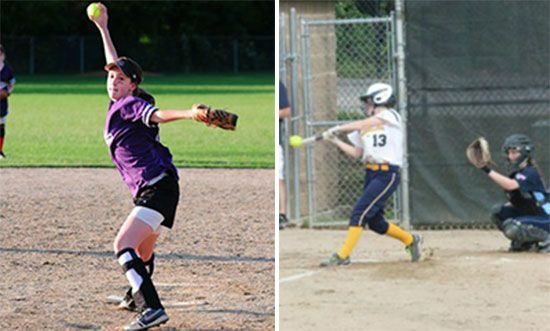 Milton Girls Softball would like to welcome two new members to our Executive Board: Calece Johnson and Tommy Walsh. Calece has been coaching for the last 6 years and a member of the Milton Girls Softball board for over 4 years. 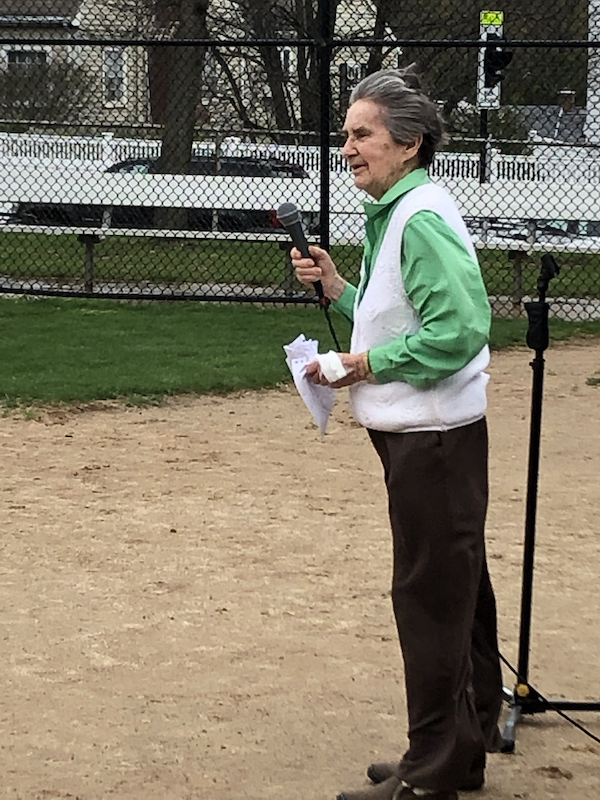 She has contributed greatly to our program working on the scholarship program, equipment inventory, by-laws, capital planning, equipment pickup/ drop-off days and many other contributions behind the scenes. Tommy has been coaching since 2001 and has been a member of the board for the last 3 years. Tommy is willing to do anything people ask of him. He has coached multiple teams during the same season, helped out with our clinics, summer and Monarchs tryouts and is the point person for our Summer Travel Program. 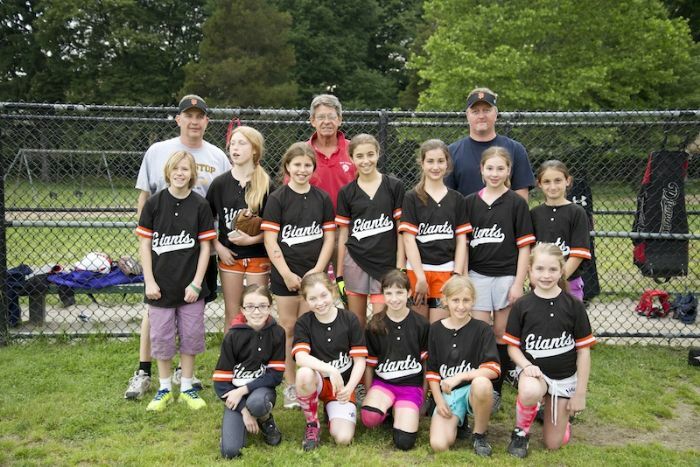 As part of the Executive Board with Brian Mullaney and Kevin Olivieri, this group leads the board by inviting participation of board members to determine and establish the leagues and programs to be offered by MGS as well as league rules, registration fees, and age requirements. We are excited to have Calece and Tommy join the Executive Board as we kick off the 2019 year. Registration for Milton Fall Travel is now open. 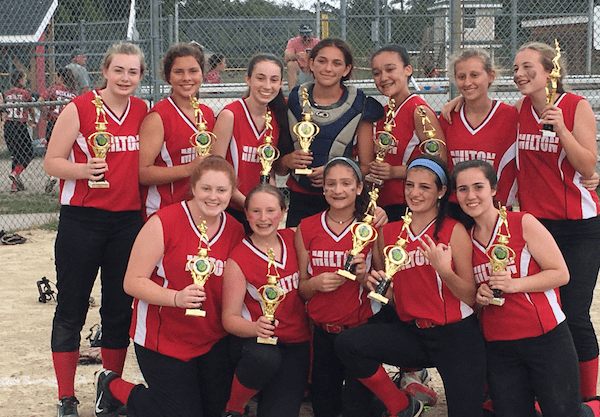 The Milton Fall Travel program is for girls who are interested in continuing to play softball after the Spring and Summer seasons. This fall we will have a team at 10U and 12U. Games are held on Sundays and typically there are not practices during the week. 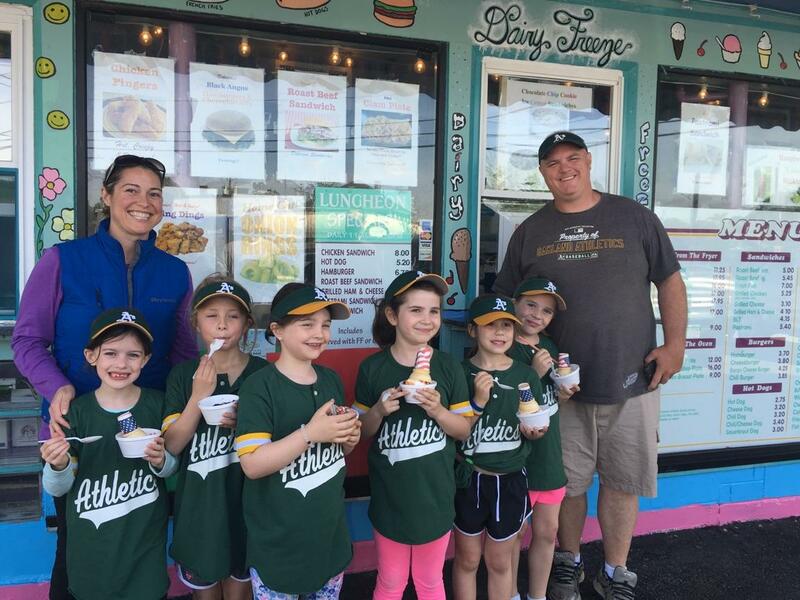 10U and 12U will play in a round robin league with local surrounding towns (such as Quincy, Braintree and Hingham). There will be a game on Sunday mornings at 9am. Games will be played through September and early October. No playoffs. The goal of this season is to get a few more throws and swings before the winter. All girls are eligible for the same age group as the summer. Cost for the 2018 Fall Travel Season is $20. Space is limited to 15 players per age level. If you register but do not submit payment, your spot is not held. Your registration is deemed complete when payment has been made. 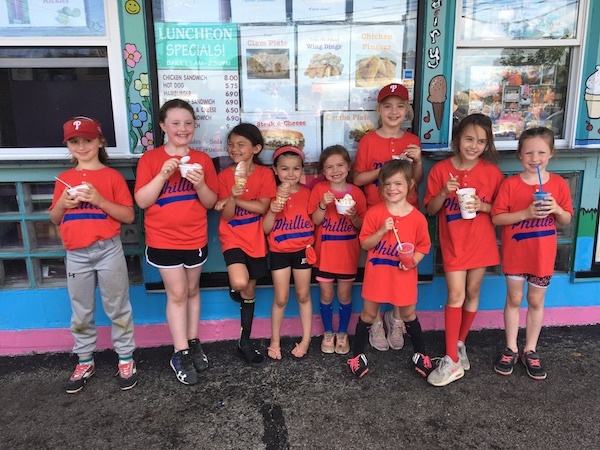 Milton Girls Softball sponsor Dairy Freeze invited the Freshwomen Phillies to a behind the scenes look of the Dairy Freeze operation. 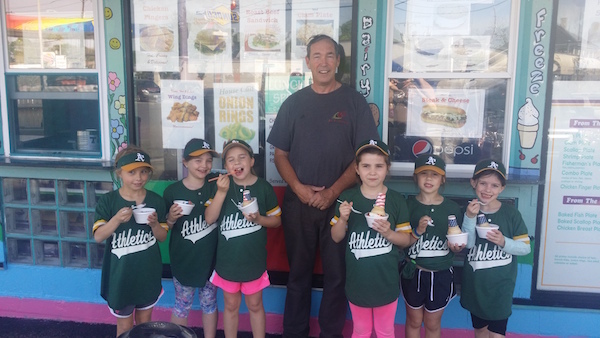 As part of the tour, the girls were able to make their own ice cream sundaes with all the fixins! Thank you Dairy Freeze! Championship Saturday crowned champions on Saturday with three amazing games. 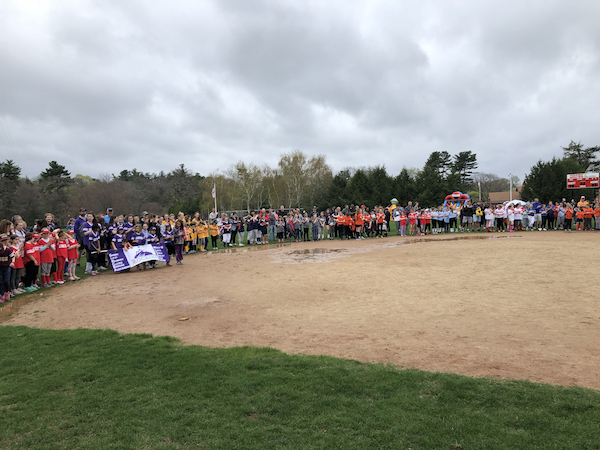 In the Sophomore Division, the game between the Blue Jays and Tigers was a back and forth affair with four lead changes before the Blue Jays scored late and hung on for the 9-8 win. 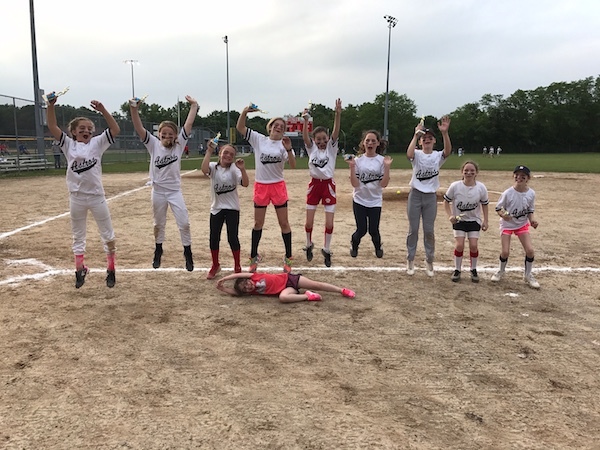 The Junior Division championship between the White Sox and the Cardinals was filled with great defense, solid pitching and clutch hitting. The White Sox had a four run lead heading into the last inning but the Cardinals rallied to tie the game at 8 and send it into extra innings. The White Sox scored a run in the 7th and hung on for the 9-8 win. The nightcap between the Phillies and the Pirates was a rematch of the 2007 championship game and this became an Instant Classic. The Phllies rallied to tie the game in the 5th, scored in the 6th to take the lead and hung on for the 8-7 win. 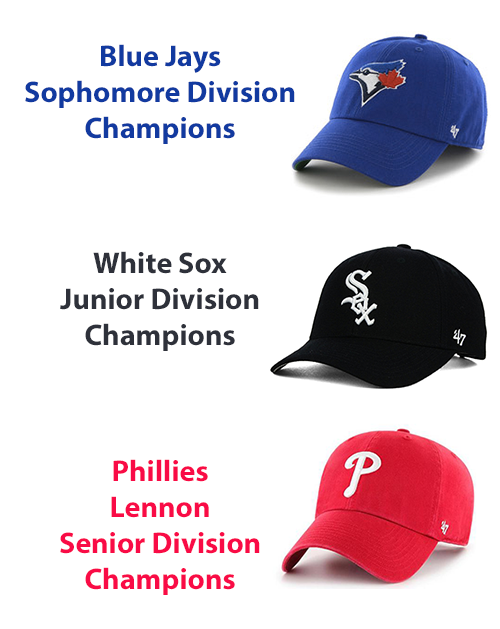 The Phillies are your 2018 Lennon Senior Division Champions. We are pleased to announce Milton High School seniors Samantha Jensen and Jenna Conroy are this year’s scholarship recipients. 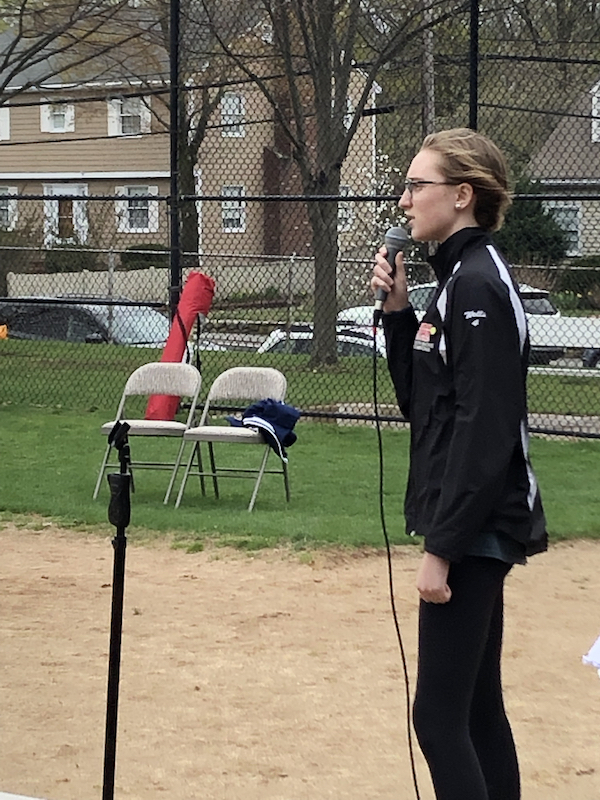 Milton Girls Softball (MGS) started a scholarship program in 2013 to be awarded annually to two seniors that have participated in MGS for a minimum of four years and are planning to continue their education. This scholarship is a one-time award to assist with finances of college, vocational school or any enlisted branch of the US Armed Forces. Both girls were presented the award and were honored to be chosen out of many candidates. 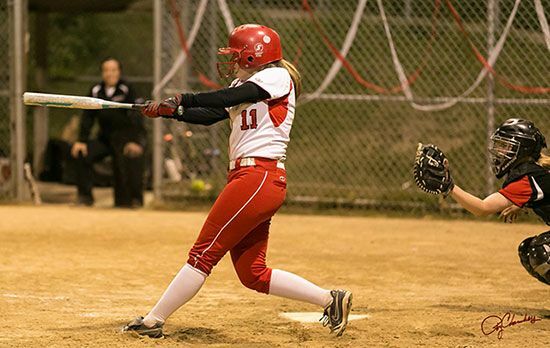 Jenna Conroy wrote about how Milton Girls Softball prepared her for her future. “People achieve good jobs and happy lives through the result of hard work. I would have never thought I would realize all of this by a small compliment at a softball practice.. Milton Girls Softball has been a huge part of my life allowing me to play a sport I love throughout high school and has prepared me to continue to play in college. 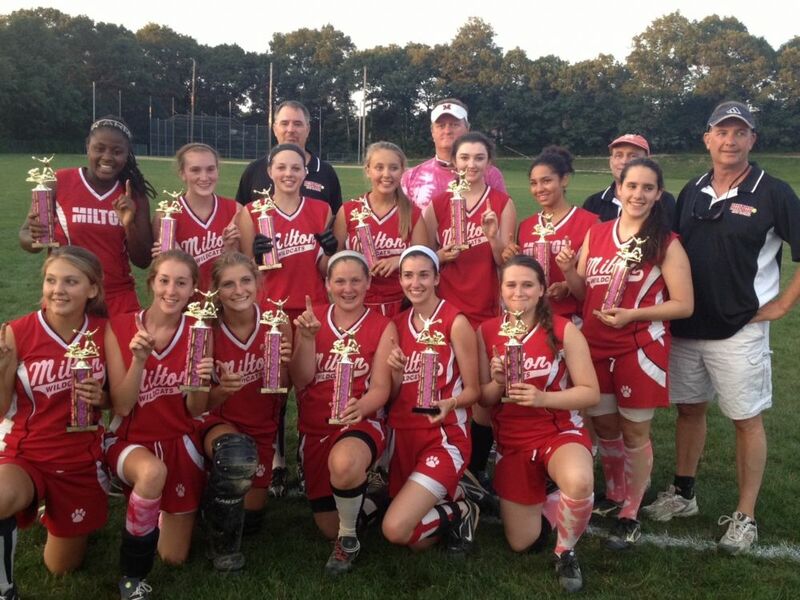 I will always have an appreciation of my time in Milton Girls Softball." Applications for next year’s scholarship will be posted online at the start of the 2019 softball spring season. 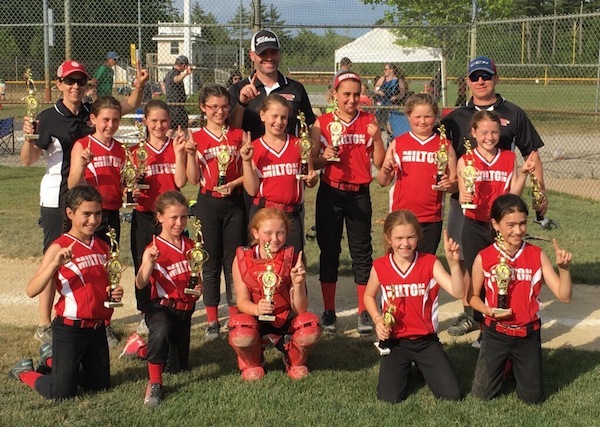 Milton Girls Softball is an independent, non-profit organization committed to providing all girls with an experience that fosters positive self-esteem, team spirit and individual growth through personal achievement and team play. Our goal is for each player to have fun while gaining knowledge of the game. We endeavor to create and maintain an environment of teamwork, honesty, and fair play with a secondary importance place on winning. 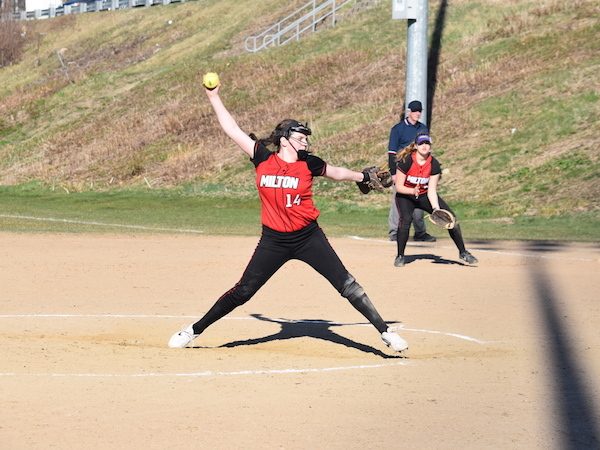 Samatha Jensen pitching for Milton High School. Jenna Conroy driving a pitch for extra bases. 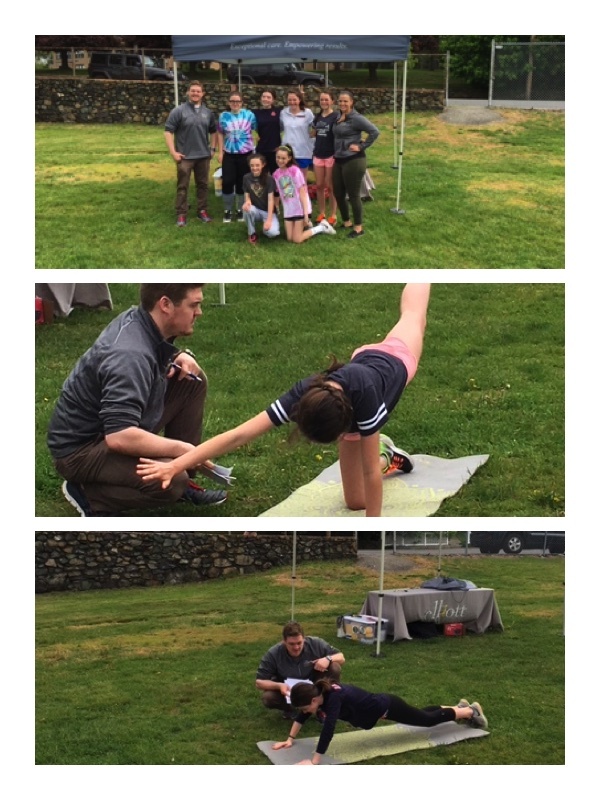 On May 20, 2018 Elliot Physical Therapy conducted injury screen assessments for senior division players of Milton Girls Softball. Each participant will receive an individual summary of their assessment. Thank you to Elliott Physical Therapy. Thanks to Milton High School Varsity Softball for sponsoring Milton Girls Softball night. The girls had a great time. Congratulations to Maria Doherty for winning our 50/50 Raffle for a $250 Fitness Unlimited Gift Certificate. Enjoy! AND THE SENIOR ATHLETICS FOR WINNING THEIR 2017 CHAMPIONSHIPS! Championship Saturday crowned three champions on Saturday. In the Sophomore Division, the game between the Dodgers and Tigers was a tight game for the early innings until the Tigers opened it up and went onto the 9-3 win. 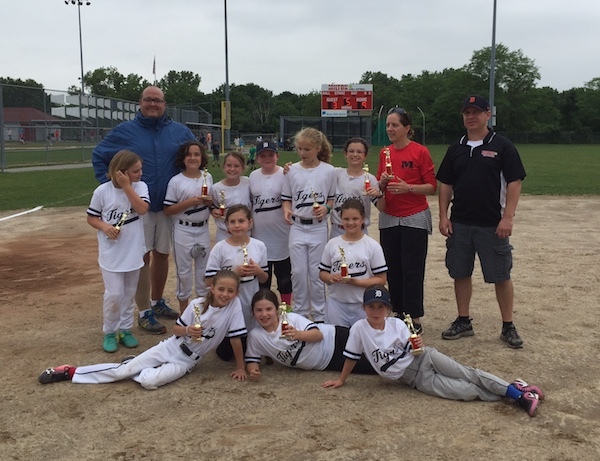 The Junior Division championship between the White Sox and the Astros was filled with great defense, solid pitching and clutch hitting. The White Sox took the lead in the bottom of the 5th inning until the Astros responded with three runs in the last inning and held on for the 7-5 victory. The nightcap between the Athletics and the Diamondbacks was a rematch of the 2016 Instant Classic. The A's beat the Dbacks by a score of 13-5 to win the 2017 Lennon Senior Division Championship. We are offering beautiful Milton Headbands for $10. Submit your order by completing this form. On Saturday, June 3rd, Milton Girls Softball recognized two of our sponsors for their support of our new scoreboard. Mike Morgan, VP Branch Manager from Blue Hills Bank and Patti & Daryl Elliot from Elliot Physical Therapy were thanked for their support of our program and our new scoreboard at Gile Field. 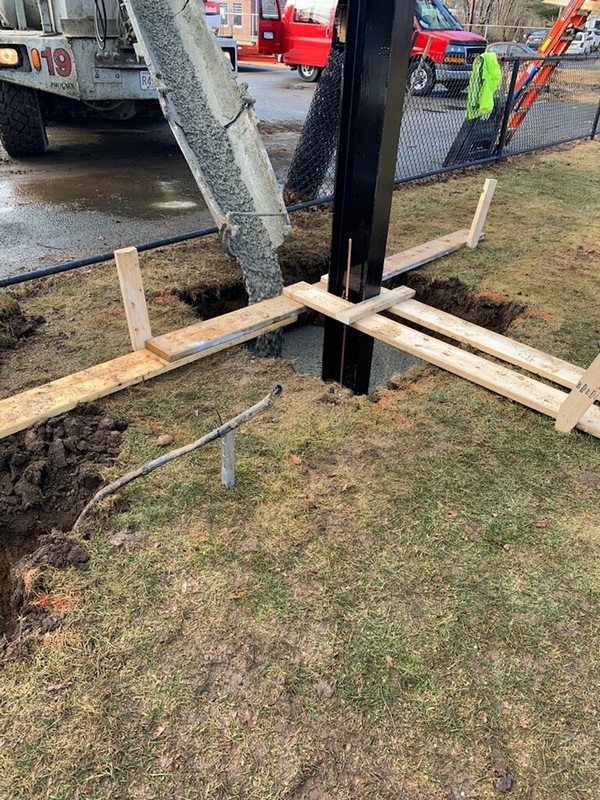 The purchase and installation of a new scoreboard at Gile has been one of our major initiatives over the last several years. Through the hard work of our Board of Directors we are excited to see our vision come to fruition. The scoreboard is one of the several projects we have taken on over the last few years including improvements to our infield and lights. 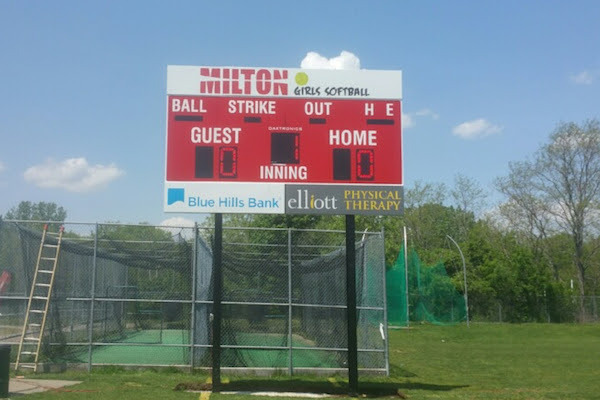 The scoreboard is available for all teams to use as well as programs outside of Milton Girls Softball including the high school softball teams. standing in front of the new scoreboard. Photo: Bob Marotta. 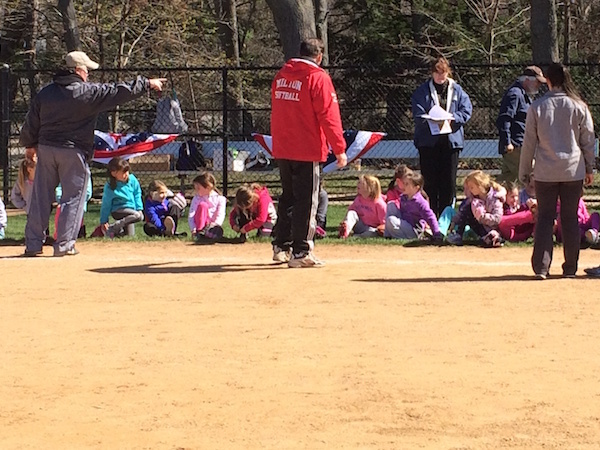 with Milton Girls Softball Board President Kevin Olivieri. Photo credit: Bob Marotta. 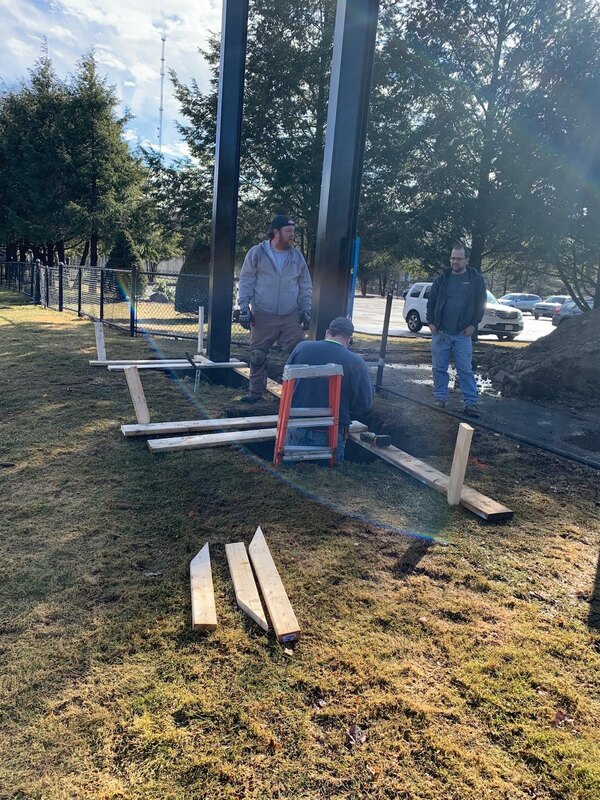 Scoreboard installation day. Photo credit: Gary Kelly. to win the 10U North Championship. AND THE SENIOR ATHLETICS FOR WINNING THEIR 2016 CHAMPIONSHIPS! Championship Saturday lived up to it's billing as all three championship games were nail biters. In the Sophomore Division, the game between the Dodgers and Rays was a close game until the Rays rallied for a 7-6 walk-off win. The Junior Division championship between the Cubs and the Astros was a pitcher's duel with the Dodgers hanging on for the 10-8 victory. 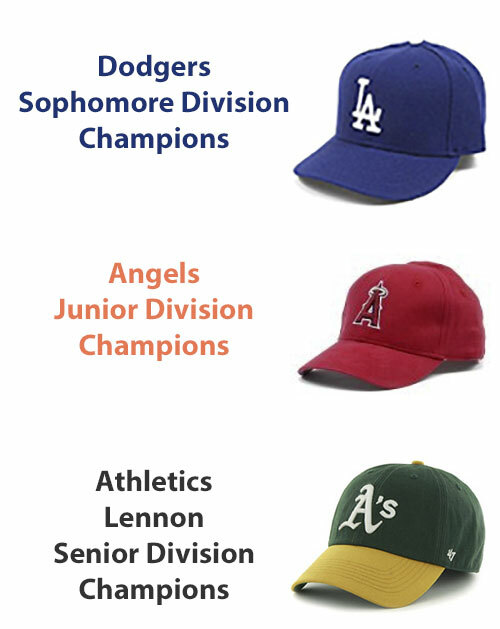 The nightcap between the Athletics and the Diamondbacks featured a back and forth game that required extra innings until the Athletics walked off with the 11-10 win and the 2016 Lennon Senior Division Championship. We are pleased to announce Fontbonne Academy senior Jordan Connelly and Milton High School senior Ashley Vaughn are this year’s scholarship recipients. 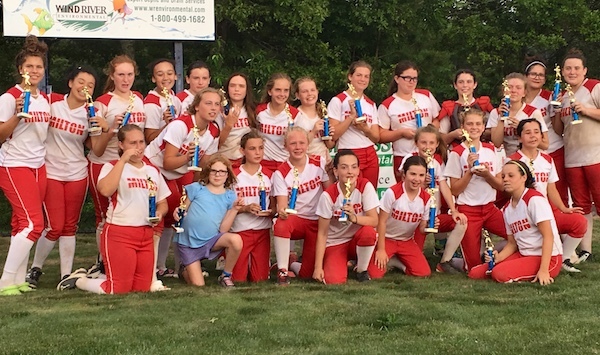 Milton Girls Softball (MGS) started a scholarship program in 2013 to be awarded annually to two seniors that have participated in MGS for a minimum of four years and are planning to continue their education. This scholarship is a one-time award to assist with finances of college, vocational school or any enlisted branch of the US Armed Forces. Applications for next year’s scholarship will be posted online at the start of the 2017 softball spring season. 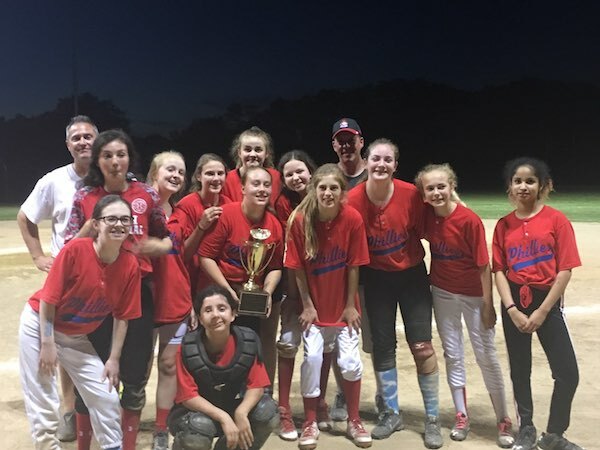 Milton Girls Softball is an independent, non-profit organization committed to providing all girls with an experience that fosters positive self-esteem, team spirit and individual growth through personal achievement and team play. Jordan Connelly is awarded the 2016 Milton Girls Softball Scholarship. She is accompanied by her parents. Ashley Vaughn is awarded the 2016 Milton Girls Softball Scholarship. Board Member Shawn Ward presented the award. 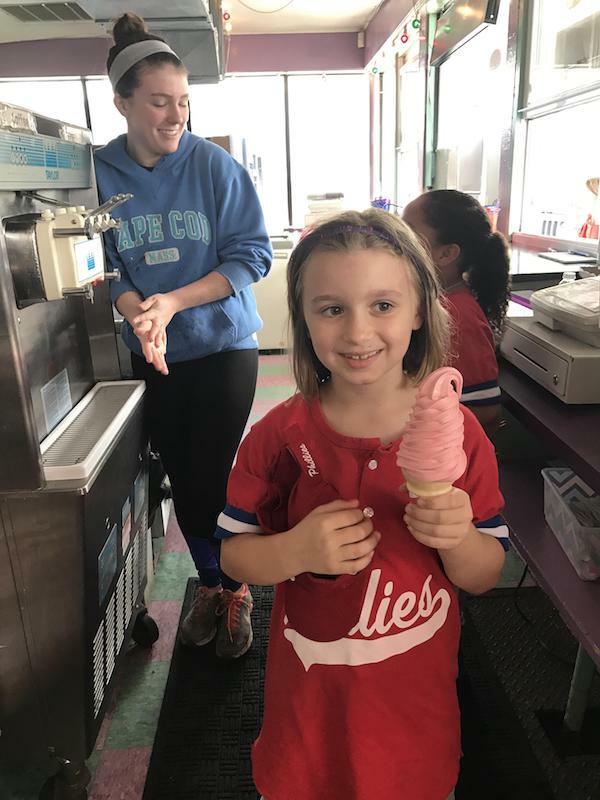 Milton Girls Softball sponsor Dairy Freeze invited the Freshwomen Athletics to a behind the scenes look of the Dairy Freeze operation. As part of the tour, the girls were able to make their own ice cream sundaes with all the fixins! Thank you Dairy Freeze! Milton entered the playoffs as the #2 seed with a record of 7-3. After winning a dramatic game on Tuesday, Milton traveled to Welcome Young Field in Quincy to take on undefeated and #1 seed Quincy. 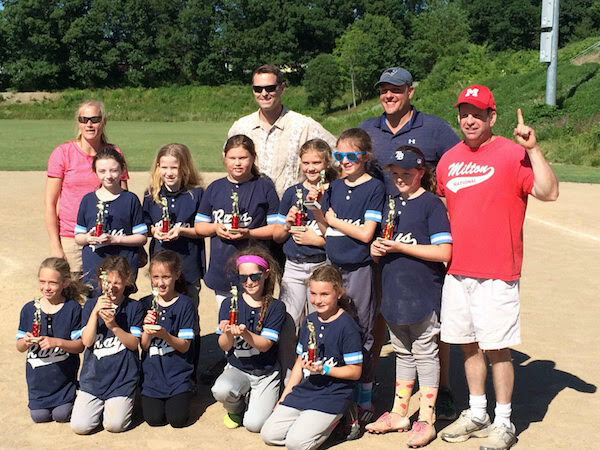 Milton U10 Mullaney put a perfect game together with strong defense, timely hitting and clutch pitching to beat Quincy 7-2 and bring home the 2015 U10 South Shore Summer League Championship. Congratulations girls! Your hard work paid off. 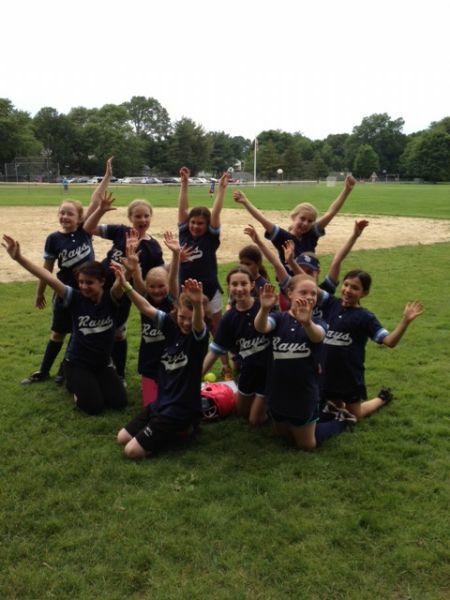 Milton previously won a U10 championship back in 2008. 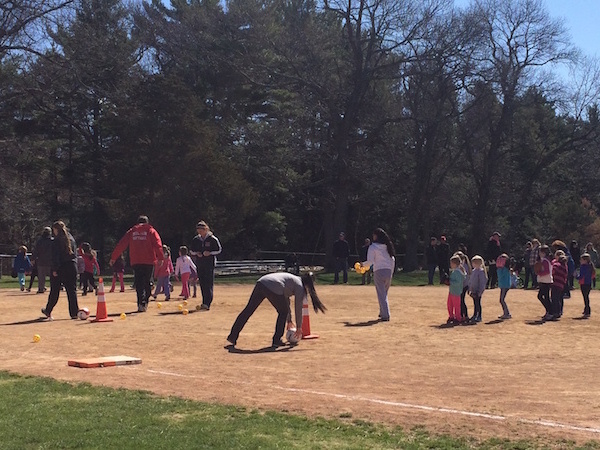 Milton Girls Softball's Kindergarten Program (K-Program) recently wrapped up a successful spring program. 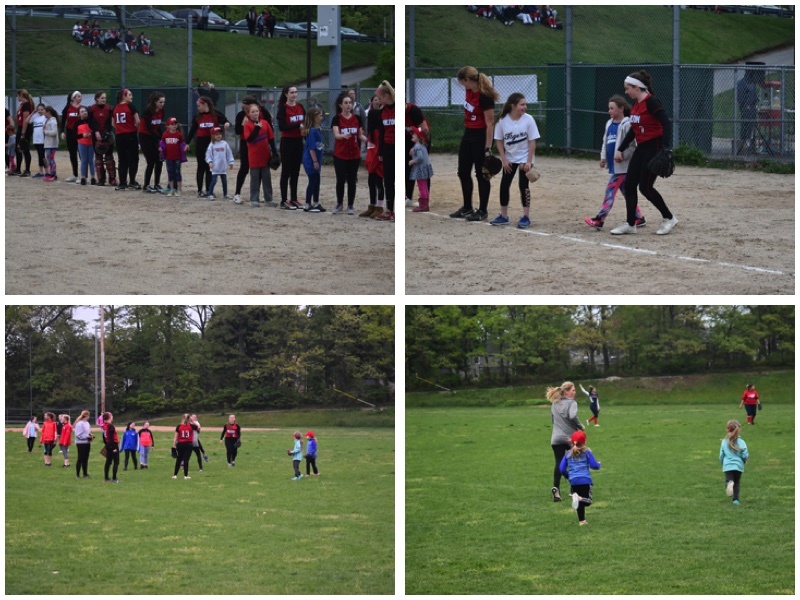 The K Program is an 8-week session designed to introduce kindergarteners to the sport of softball as well as provide an opportunity for them to play and interact in a safe, stimulating, and nurturing environment. The K-Program was run by two experienced directors and instructors for the program. 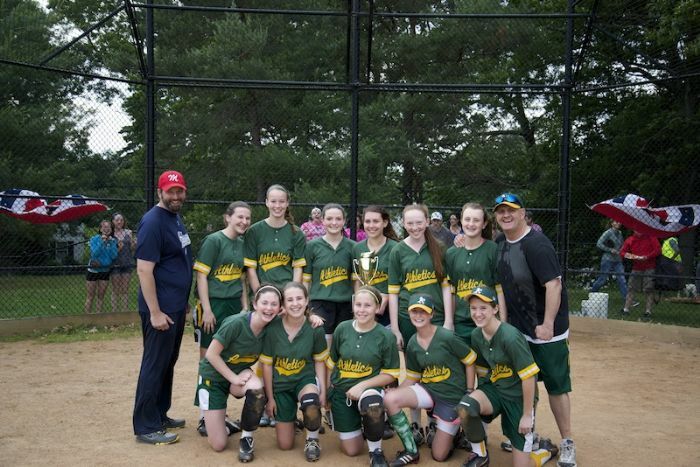 Mike Kinsella is a Milton resident and a 15+ year coach in the Milton Girls Softball program. He is also a professional instructor for Dirt Dawg Sports in Canton. 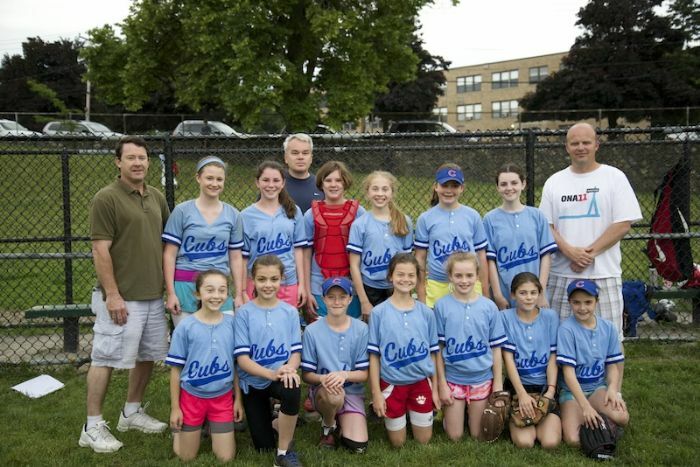 Gary Kelly has been involved with Milton Girls Softball for over 20 years as a coach, league president and board member. Both are tremendous assets to the K Program. Mike and Gary's philosophy focuses on teaching the developmental aspect more so than the instructional aspect of the sport. However, none of this will matter if it’s not done by having FUN. The K Program is about keeping the girls engaged. This will be done with positive reinforcement, smiling a lot, giving lots of high-fives and keeping the players moving and involved. The structure of the K Program was about breaking down the actual practice into stations. Stations are efficient, effective, and FUN. 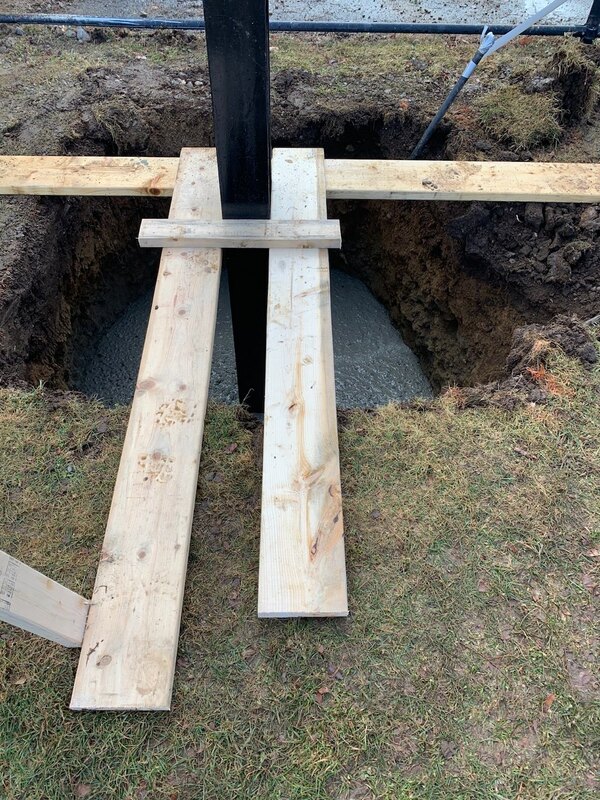 This will be done by having a staff of trained instructors and high school players to ensure the direct developmental instruction is consistent and delivered the correct way fundamentally. Parents were encouraged to be involved if desired. We want parents to learn by observing and/or participating with the goal that parents may coach when their daughters move up to the Freshwomen Division the following year. To learn more about the program, please visit the Kindergarten Program Page. We are pleased to announce Milton High School seniors Olivia FitzGerald and Molly Concannon are this year’s scholarship recipients. 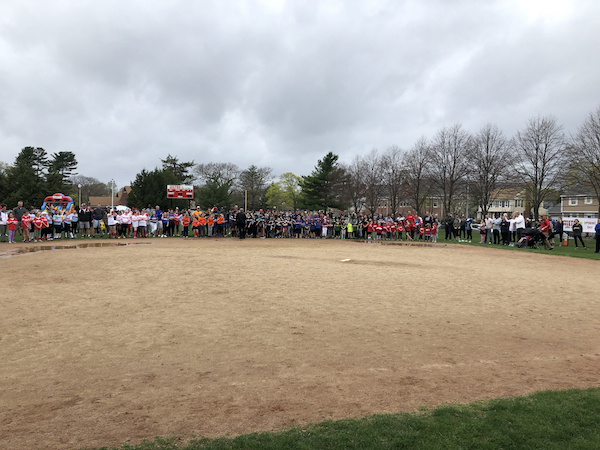 Milton Girls Softball (MGS) started a scholarship program in 2013 to be awarded annually to two seniors that have participated in MGS for a minimum of four years and are planning to continue their education. This scholarship is a one-time award to assist with finances of college, vocational school or any enlisted branch of the US Armed Forces. Both girls were presented the award at the Milton High award banquet and were honored to be chosen out of many candidates. 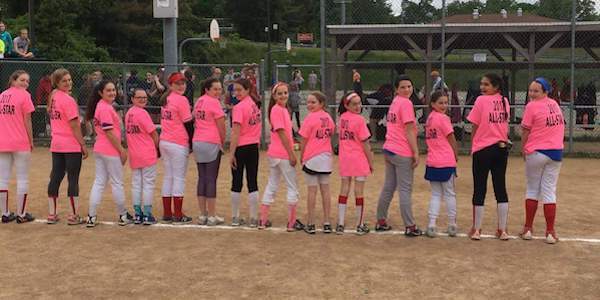 Olivia Fitzgerald wrote about how Milton Girls Softball help her become the leader she is today. 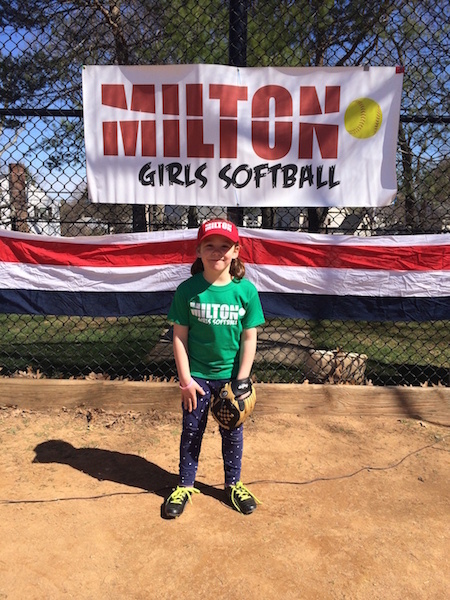 "Milton Girls Softball has prepared me to become a leader because throughout the years I have participated, my confidence has grown and I have gone from one of the little girls learning the sport to a mentor for young players." 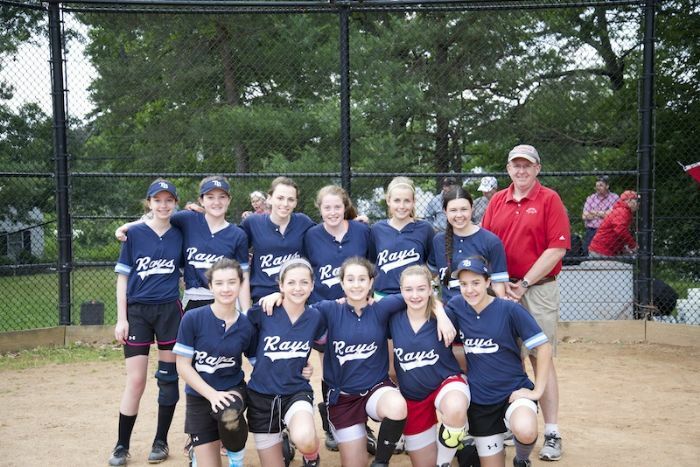 Molly Concannon wrote about how the experience of playing in our town program meant a lot to her: "Being a member of Milton Girls Softball for as long as I have has been the most rewarding and special experience a girl could ask for. Milton Girls Softball has prepared me for my future endeavors and I hope to make my coaches and teammates proud." Applications for next year’s scholarship will be posted online at the start of the 2015 softball spring season. 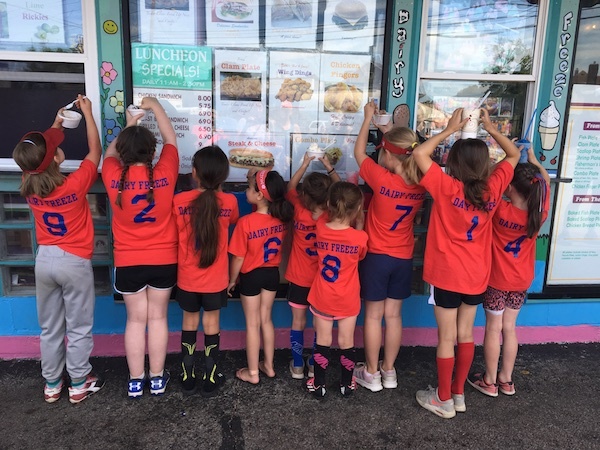 Milton Girls Softball is an independent, non-profit organization committed to providing all girls with an experience that fosters positive self-esteem, team spirit and individual growth through personal achievement and team play. AND THE SENIOR ATHLETICS FOR WINNING THEIR 2015 CHAMPIONSHIPS! Championship Saturday lived up to it's billing as all three championship games were nail biters. In the Sophomore Division, the game between the Dodgers and Blue Jays saw five lead changes before the Dodgers held on for the 12-11 win. 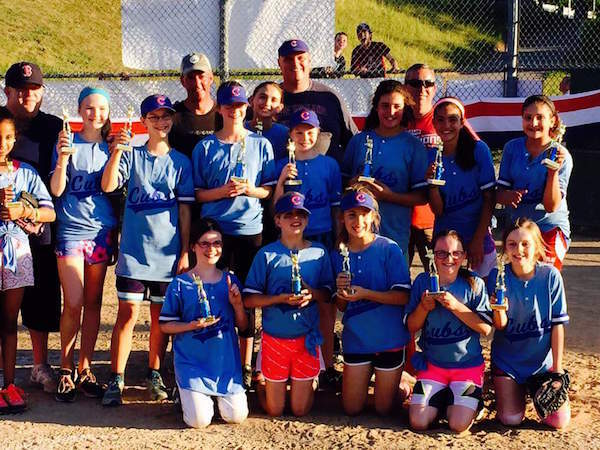 The Junior Division championship between the Angels and the Cubs was a pitcher's duel with the Angels hanging on for the 4-3 win. 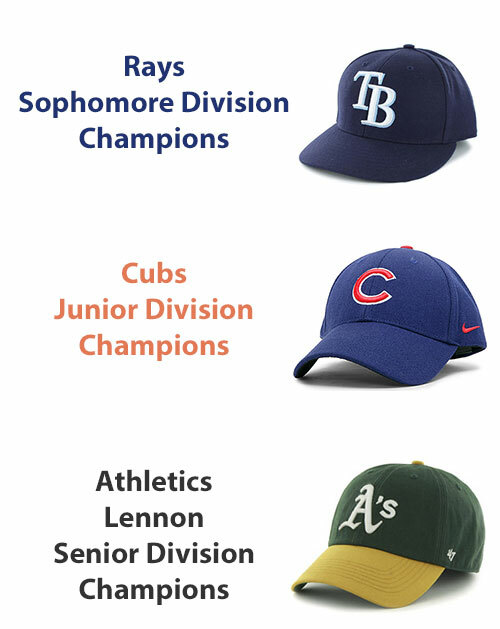 The nightcap between the Athletics and the Phillies featured a back and forth game with the Athletics pulling away for the 11-8 win and the 2015 Lennon Senior Division Championship. Milton Girls Softball sponsor Dairy Freeze invited the Freshwomen Cardinals to a behind the scenes look of the Dairy Freeze operation. 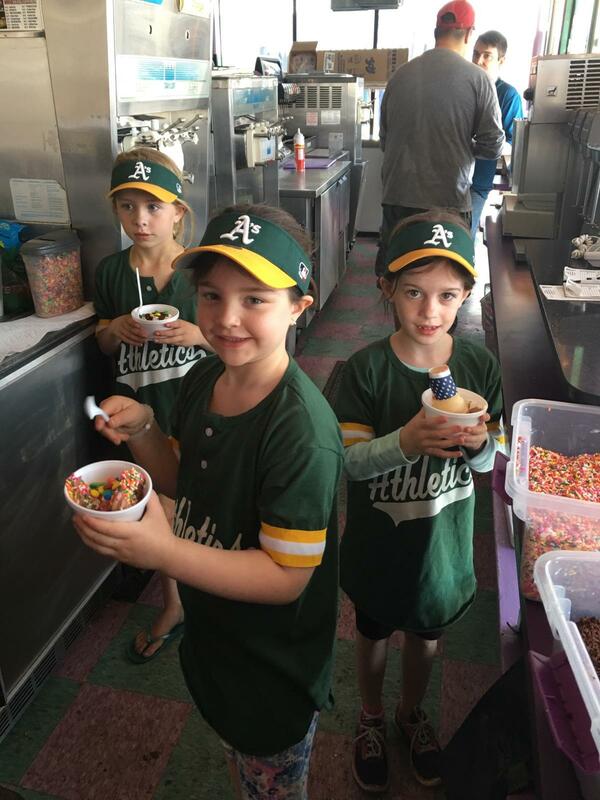 As part of the tour, the girls were able to make their own ice cream sundaes with all the fixins! Thank you Dairy Freeze! According to Wikipedia, volunteering is "generally considered an altruistic activity and is intended to promote goodness or improve human quality of life. In return, this activity can produce a feeling of self-worth and respect. There is no financial gain involved for the individual. Volunteering is also renowned for skill development, socialization, and fun. Volunteering may have positive benefits for the volunteer as well as for the person or community served. 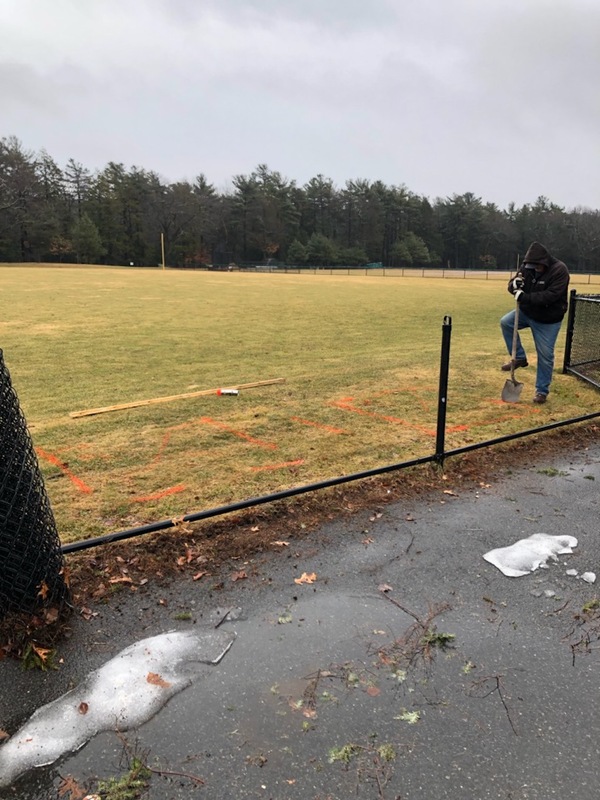 As a volunteer organization, we would like to share the following Milton Patch article from a volunteer coach for the Easton Youth Soccer Program. We are pleased to announce Milton High School seniors Juliann Cosetta and Julia Moore are this year’s scholarship recipients. 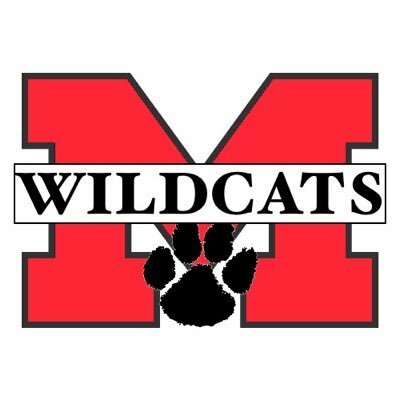 Milton Girls Softball (MGS) started a scholarship program in 2013 to be awarded annually to two seniors that have participated in MGS for a minimum of four years and are planning to continue their education. This scholarship is a one-time award to assist with finances of college, vocational school or any enlisted branch of the US Armed Forces. Applications for next year’s scholarship will be posted online at the start of the 2015 softball season. 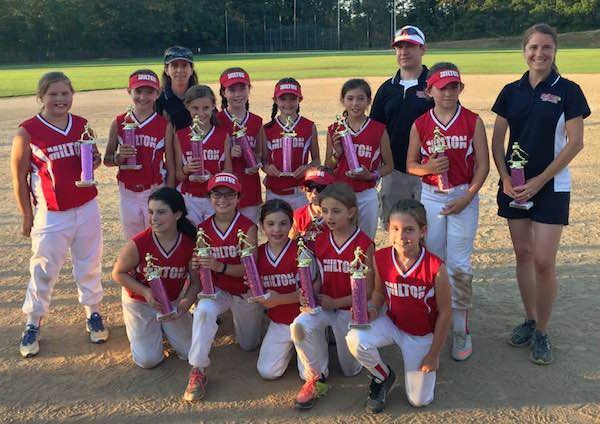 Milton Girls Softball is an independent, non-profit organization committed to providing all girls with an experience that fosters positive self-esteem, team spirit and individual growth through personal achievement and team play. 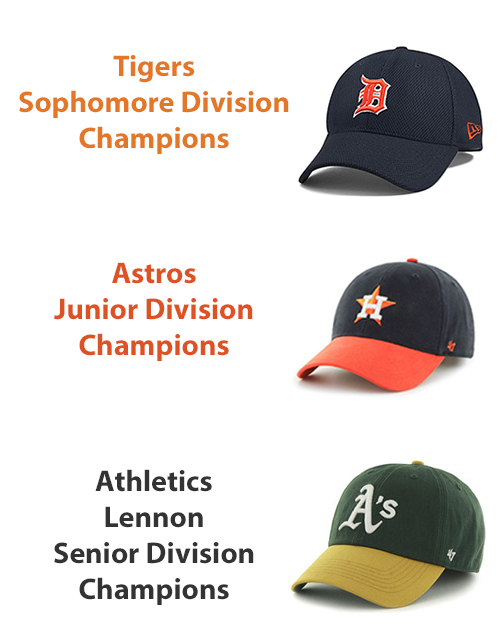 INTERESTED IN BUYING A BATTING HELMET? Milton U18 hosted Scituate in the U18 Championship on Wednesday night at Gile Road. Milton (10-1) was hoping to avenge it's only loss of the season and take the 2013 Championship crown. The game was tight throughout and both teams were tied at the end of seven innings. In the top of the 8th, Scituate rallied to load the bases with 1 out. Third basemen Julia Moore made a great play at third going to her left and firing home to get the force out. The next batter to grounded out to Pitcher Shannon FitzGerald to end the rally. 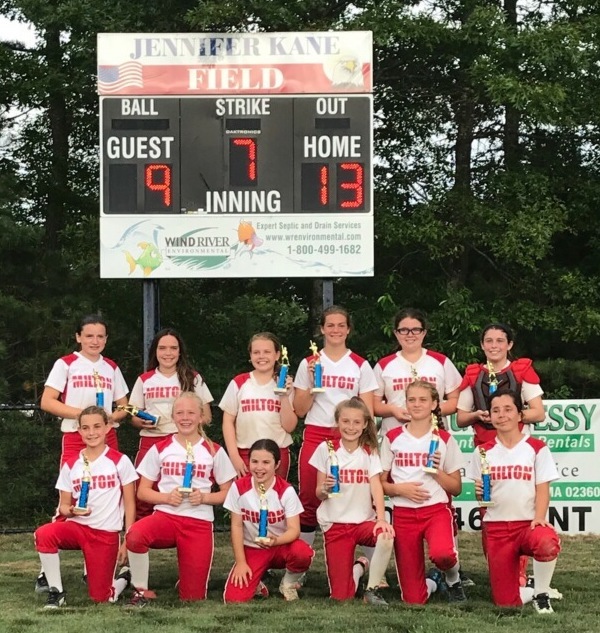 In the bottom of the 8th, Milton had a runner on third with two outs when Victoria Hansbury lined a hit to left center field for the walk-off win. AND THE SENIOR ATHLETICS FOR WINNING THEIR 2013 CHAMPIONSHIPS! We are pleased to announce that Milton residents and Seniors Sydney FitzGerald and Lauren Kinsella are this year’s scholarship recipients. 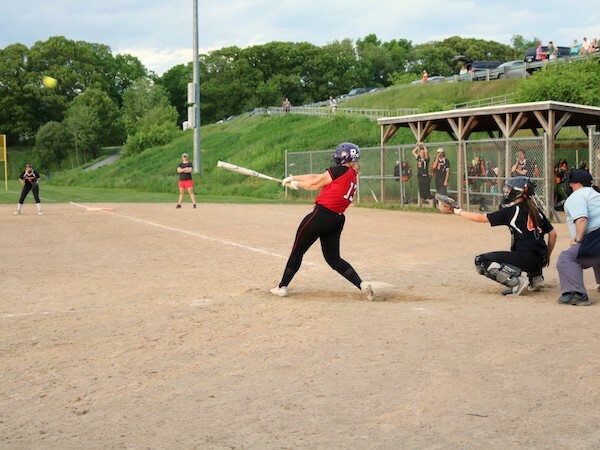 We started a scholarship program to be awarded annually to two seniors that have participated in the Milton Girls Softball program for a minimum of four years and are planning to continue their education. This scholarship is a one-time award to assist with finances of college, vocational school or any enlisted branch of the US Armed Forces. Both girls were presented the award at their respective high school award banquet and were honored to be chosen out of so many candidates. When asked what Milton Girls Softball meant to them, Syndey was quick to reply “many of my memories were made on a softball field. Whether playing for a spring or summer team or practicing with my dad in the backyard, these were moments that I was proud for working my absolute hardest. From the start, accomplishing small goals such as getting a hit or striking out 10 batters over the course of a game gave me a kind of personal contentment that I can't explain. 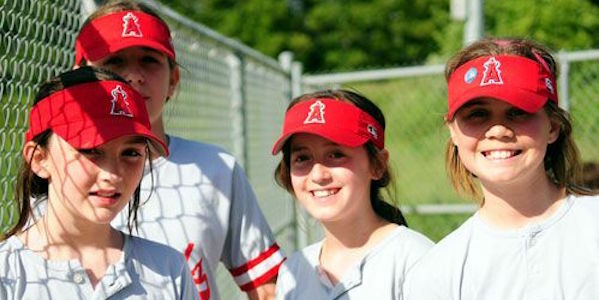 The Milton Girls Softball Association helped me develop the confidence that I have needed to survive as I've grown up." Applications for next year’s scholarship will be posted online at the start of the 2014 softball season. 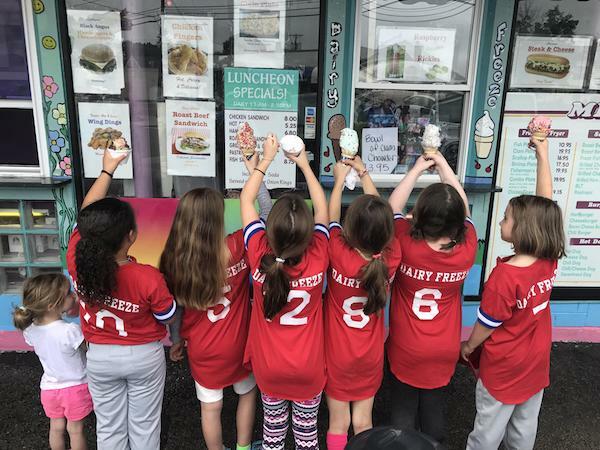 Milton Girls Softball is an independent, non-profit organization committed to providing all girls with an experience that fosters positive self-esteem, team spirit and individual growth through personal achievement and team play. Would you like to volunteer? Tell us how you would like to help. Poll Question: Would You Like To Play on Memorial Day Weekend? 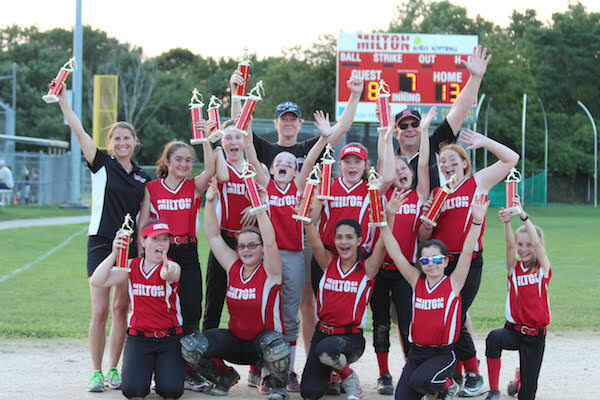 Check out the Milton Girls Softball Equipment Exchange! Milton Girls Softball has set up an exchange where families can trade and sell used softball equipment. Maybe you have an old glove you would like to sell? Or maybe a bat that your daughter has outgrown? Check your basement. 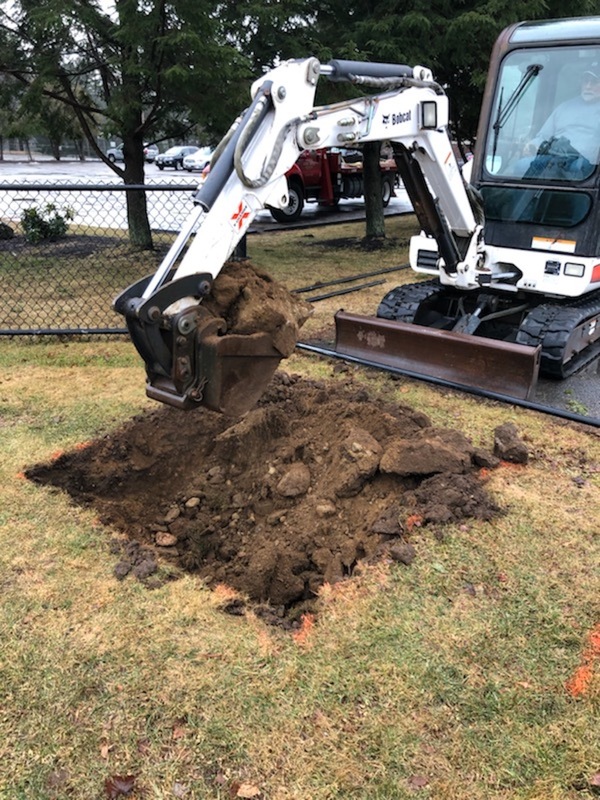 Dig through your garage. You will be helping other players and you may even make a few bucks for yourself. 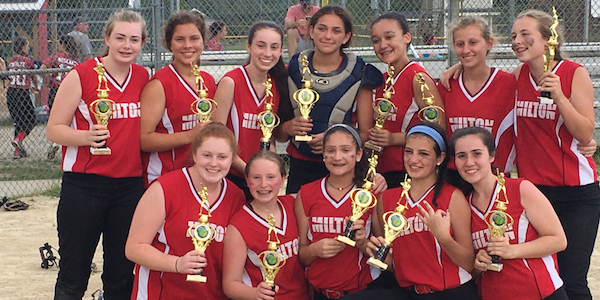 View the Milton Girls Softball Equipment Exchange. Take the Quizball Challenge and find out just how much you know!